Modular 4” square structural tube frame construction with continuous welds, and tubular cross bracing. Horizontal frame tubes are turned 45° to reduce flat surfaces. Eriez dust-tight vibratory feeder with an 18” wide x 42” long stainless steel tray and variable speed controls. Unit includes a custom MTS Flo-Lock™ slide gate for partial bag discharge. 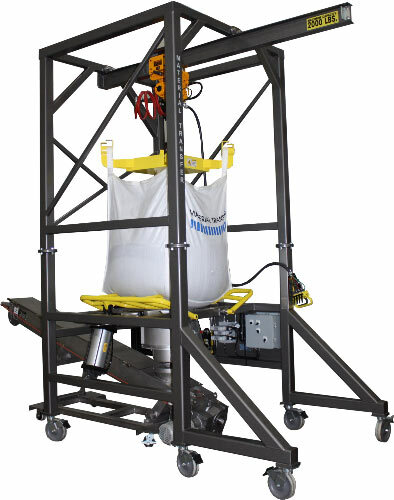 2-Ton Harrington hoist provides safe, efficient bag loading and unloading. Exclusive Flo-Master™ massaging system with pipe massaging frames promotes discharge of non-free flowing materials. Unit includes our exclusive 304 stainless steel Seal-Master™ dust-tight bag spout access chamber. 35” clearance beneath feeder outlet. 304 stainless steel product contact surfaces. Custom discharge transition with material clean out port. Loss-in-weight load cell package with 4-20 ma output to customer’s PLC. Hoffman NEMA4 terminal and solenoid enclosure.